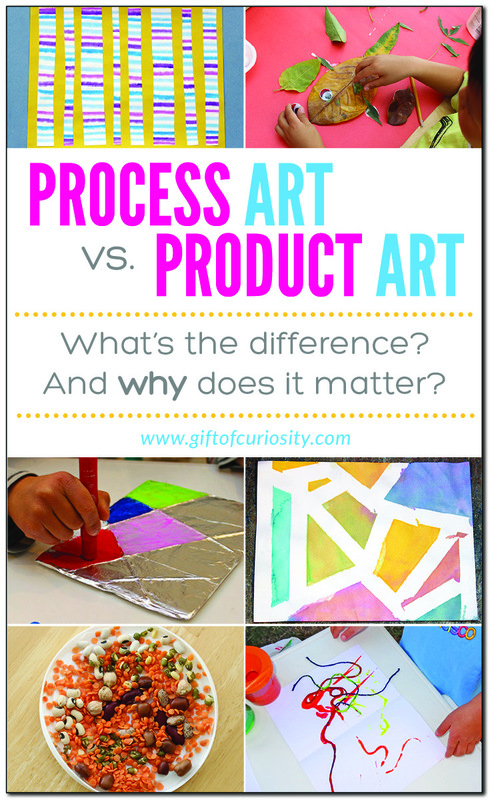 Process art vs. product art: What is the difference? Children’s art can generally be broken down into two different categories: PROCESS and PRODUCT. So, what is the difference between process art vs. product art? And why does this difference matter? What is the difference between process art and product art? The quick answer to this question is that with process art, the value is in the experience of creating the artwork and exploring materials and techniques. In contrast, with product art the value is in the final result rather than in the experience of producing it. I am not denying that there is value in having children create art as a product. Some benefits include learning how to follow multi-step directions and developing fine motor skills like tracing and cutting. However, product-oriented art does little to stimulate playful creativity. Nor does it give children opportunities to think outside the box and try new things. So today I’m going to talk about the value of process-oriented art for children. Why are process-oriented art experiences important for children? Process-oriented art experiences, by their very nature, facilitate exploration, creativity, and relaxation. They stimulate out-of-the-box thinking and can lead to new discoveries – qualities we need to nurture in our future leaders and innovators! Process-oriented art facilitates self-expression and encourages children to make connections to the world around them. When children engage in art as a process, they have opportunities to predict, plan, compare, and problem solve. They also get to feel a sense of ownership and pride in their original creations. You do not have to follow all of these tips every single time, but these are some great guidelines to keep in mind when giving your children opportunities to engage in process-oriented art experiences. Provide a variety of different materials for children to use (paper, ripped newsprint, paint, string, leaves, glue, buttons, glitter, markers, clay, tissue paper, etc.). Allow plenty of time for children to explore and create. 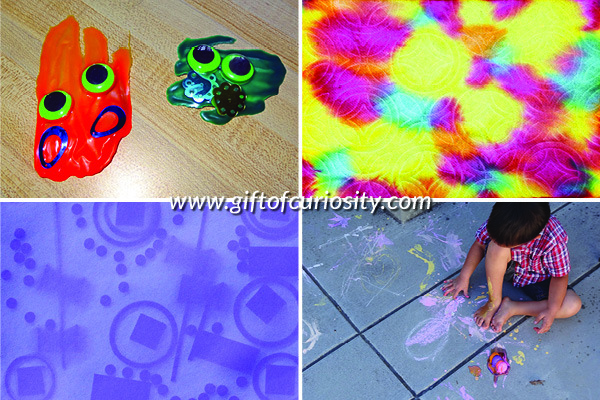 Say “yes” to the creative ideas your children come up with for their artwork. Teach techniques, not products. 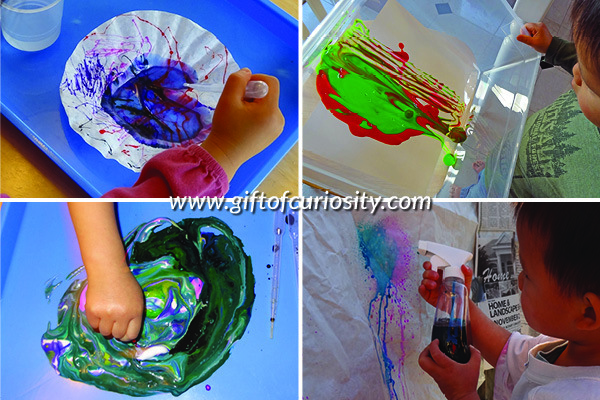 For example, teach children how they can use a tape resist technique to create lines in their art or how they can use a paint dripping technique to make splotches on their paper. Not all art will be “wall worthy” – and that’s okay! My children do a lot of art. Some of it is beautiful, and I jokingly refer to it as “wall worthy.” A lot of my kids’ artwork ends up on a wall somewhere in our home. But sometimes they create art that doesn’t look “beautiful” at the end and I don’t put everything they make up on a wall. And that’s okay too. When art is a process rather than a product, the value of the activity was in the making of the art rather than in the final product. The value is in the free exploration, creative process, and the hands-on experience. Adults need to understand that simply doing art has intrinsic value, even if the final product isn’t something you’d want to hang on the wall or save in a scrapbook. I LOVE this article! Thank you so much for posting it. I teach Early Head Start (ages 6 weeks to 36 months) and we are only really allowed to do process art! This article really helped me see the value and gave me some great ideas for future projects! I will definitely share it with my fellow teachers and others! Thank you! Thank you for letting me know this article has helped you in your work. All the best to you and your students!